Of lees dit review artikel: Tumor treating fields: a novel treatment modality and its use in brain tumors. Deze resultaten bevestigen de eerder vrijgegeven tussenresultaten die de basis vormden voor de FDA goedkeuring van het Novocure apparaat voor de eerstelijns behandeling van een glioblastoom in 2015. En deze nieuwe publicatie bevestigt ook hiermee de resultaten uit een studie uitgevoerd bij patienten met een recidief van een glioblastoma na standaard eerstelijns behandeling. In March 2010, the Neurological Devices Panel of the Medical Devices Advisory Committee voted 7 to 3 (with 2 abstentions) that, overall, the benefits of NovoTTF outweigh the risks in recurrent GBM. Volgens hoofdonderzoeker Roger Stupp, MD, een neuro-oncoloog aan de Northwestern University in Chicago, Illinois, legde uit dat het overlevingsvoordeel dat door de Novocure wordt gerealiseerd de eerste significante verbetering is nadat temodal - temozolomide in (TMZ) (Temodar, Merck) goedgekeurd is in 2005. De mediane overall overleving is vergelijkbaar met die van temodal - temozolomide. Samen verlengt het de overall overleving statistisch significant. De mediane algehele overleving voor de Novocure - TTF / temodal - TMZ groep was 20,9 maanden, versus 16,0 maanden voor temodal - TMZ alleen (HR, 0,63; P = .00006). Op 2 jaars meting leefde 43,1% van de TTF / TMZ-groep nog steeds, tegenover 37,0% van de TMZ-alleengroep. Interessant is ook deze studie: NovoTTF™-100A System (Tumor Treating Fields) transducer array layout planning for glioblastoma: a NovoTAL™ system user study waarin artsen / oncologen van buiten Novocure werd gevraagd om scans te beoordelen enz. En vergeleken met de beoordelingen van de artsen / oncol;goen die bij de producent van Novocure werkten. Ook deze studie: Planning TTFields treatment using the NovoTAL system-clinical case series beyond the use of MRI contrast enhancement. beschrijft dit proces. In this interim analysis of 315 patients with glioblastoma who had completed standard chemoradiation therapy, adding TTFields to maintenance temozolomide chemotherapy significantly prolonged progression-free and overall survival. Conclusions In this interim analysis of 315 patients with glioblastoma who had completed standard chemoradiation therapy, adding TTFields to maintenance temozolomide chemotherapy significantly prolonged progression-free and overall survival. JAMA. 2015 Dec 15;314(23):2535-43. doi: 10.1001/jama.2015.16669. Stupp R1, Taillibert S2, Kanner AA3, Kesari S4, Steinberg DM5, Toms SA6, Taylor LP7, Lieberman F8, Silvani A9, Fink KL10, Barnett GH11, Zhu JJ12, Henson JW13, Engelhard HH14, Chen TC15, Tran DD16, Sroubek J17, Tran ND18, Hottinger AF19, Landolfi J20, Desai R21, Caroli M22, Kew Y23, Honnorat J24, Idbaih A2, Kirson ED25, Weinberg U25, Palti Y25, Hegi ME19, Ram Z3. Glioblastoma is the most devastating primary malignancy of the central nervous system in adults. Most patients die within 1 to 2 years of diagnosis. Tumor-treating fields (TTFields) are a locoregionally delivered antimitotic treatment that interferes with cell division and organelle assembly. To evaluate the efficacy and safety of TTFields used in combination with temozolomide maintenance treatment after chemoradiation therapy for patients with glioblastoma. After completion of chemoradiotherapy, patients with glioblastoma were randomized (2:1) to receive maintenance treatment with either TTFields plus temozolomide (n = 466) or temozolomide alone (n = 229) (median time from diagnosis to randomization, 3.8 months in both groups). The study enrolled 695 of the planned 700 patients between July 2009 and November 2014 at 83 centers in the United States, Canada, Europe, Israel, and South Korea. The trial was terminated based on the results of this planned interim analysis. 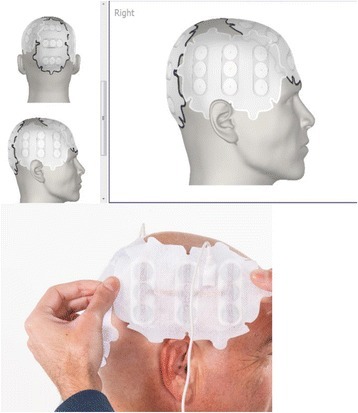 Treatment with TTFields was delivered continuously (>18 hours/day) via 4 transducer arrays placed on the shaved scalp and connected to a portable medical device. Temozolomide (150-200 mg/m2/d) was given for 5 days of each 28-day cycle. The primary end point was progression-free survival in the intent-to-treat population (significance threshold of .01) with overall survival in the per-protocol population (n = 280) as a powered secondary end point (significance threshold of .006). This prespecified interim analysis was to be conducted on the first 315 patients after at least 18 months of follow-up. The interim analysis included 210 patients randomized to TTFields plus temozolomide and 105 randomized to temozolomide alone, and was conducted at a median follow-up of 38 months (range, 18-60 months). Median progression-free survival in the intent-to-treat population was 7.1 months (95% CI, 5.9-8.2 months) in the TTFields plus temozolomide group and 4.0 months (95% CI, 3.3-5.2 months) in the temozolomide alone group (hazard ratio , 0.62 [98.7% CI, 0.43-0.89]; P = .001). Median overall survival in the per-protocol population was 20.5 months (95% CI, 16.7-25.0 months) in the TTFields plus temozolomide group (n = 196) and 15.6 months (95% CI, 13.3-19.1 months) in the temozolomide alone group (n = 84) (HR, 0.64 [99.4% CI, 0.42-0.98]; P = .004). Use of TTFields prolongs progression-free and overall survival in patients with glioblastoma. The addition of this novel device-delivered treatment neither negatively affects nor improves functioning and well-being of the patient, including critical HRQOL issues, such as role, social, and physical functioning. Patients reported more itchy skin, which is a direct and expected consequence of the placement of transducer arrays on the patients’ scalp. Considering the net clinical benefit, our HRQoL data support the addition of TTFields to standard therapy in patients with glioblastoma. Question What is the influence of adding tumor-treating fields to the standard treatment on health-related quality of life in patients with glioblastoma? Findings In this secondary analysis of the EF-14 randomized clinical trial, the addition of tumor-treating fields did not negatively influence health-related quality of life except for itchy skin, an expected consequence from the transducer arrays. Meaning Tumor-treating field therapy has previously been shown to prolong both progression-free and overall survival. When considering the net clinical benefit, improved survival without a negative influence on health-related quality of life supports the addition of tumor-treating fields to standard treatment in patients with glioblastoma. Importance Tumor-treating fields (TTFields) therapy improves both progression-free and overall survival in patients with glioblastoma. There is a need to assess the influence of TTFields on patients’ health-related quality of life (HRQoL). Objective To examine the association of TTFields therapy with progression-free survival and HRQoL among patients with glioblastoma. Design, Setting, and Participants This secondary analysis of EF-14, a phase 3 randomized clinical trial, compares TTFields and temozolomide or temozolomide alone in 695 patients with glioblastoma after completion of radiochemotherapy. Patients with glioblastoma were randomized 2:1 to combined treatment with TTFields and temozolomide or temozolomide alone. The study was conducted from July 2009 until November 2014, and patients were followed up through December 2016. Interventions Temozolomide, 150 to 200 mg/m2/d, was given for 5 days during each 28-day cycle. TTFields were delivered continuously via 4 transducer arrays placed on the shaved scalp of patients and were connected to a portable medical device. Main Outcomes and Measures Primary study end point was progression-free survival; HRQoL was a predefined secondary end point, measured with questionnaires at baseline and every 3 months thereafter. Mean changes from baseline scores were evaluated, as well as scores over time. Deterioration-free survival and time to deterioration were assessed for each of 9 preselected scales and items. Results Of the 695 patients in the study, 639 (91.9%) completed the baseline HRQoL questionnaire. Of these patients, 437 (68.4%) were men; mean (SD) age, 54.8 (11.5) years. Health-related quality of life did not differ significantly between treatment arms except for itchy skin. Deterioration-free survival was significantly longer with TTFields for global health (4.8 vs 3.3 months; P < .01); physical (5.1 vs 3.7 months; P < .01) and emotional functioning (5.3 vs 3.9 months; P < .01); pain (5.6 vs 3.6 months; P < .01); and leg weakness (5.6 vs 3.9 months; P < .01), likely related to improved progression-free survival. Time to deterioration, reflecting the influence of treatment, did not differ significantly except for itchy skin (TTFields worse; 8.2 vs 14.4 months; P < .001) and pain (TTFields improved; 13.4 vs 12.1 months; P < .01). Role, social, and physical functioning were not affected by TTFields. Conclusions and Relevance The addition of TTFields to standard treatment with temozolomide for patients with glioblastoma results in improved survival without a negative influence on HRQoL except for more itchy skin, an expected consequence from the transducer arrays. Fayers P, Aaronson N, Bjordal K, et al, eds. EORTC QLQ-C30 Scoring Manual. 3rd ed. Brussels, Belgium: EORTC Publications; 2001. Reageer op "NovoTTF™-100A (TTF = vorm van electro hyperthermie) geeft veel langere mediane overleving, 5 maanden, bij nieuwe diagnose hersentumoren glioblastoma in vergelijking met temodal - temozolomide alleen"